A great way to show your support for Hermit_theCrab gaming is to subscribe to Hermit_theCrab Gaming. You can subscribe through GameWisp, a service that allows streamers to set up a personalized subscription system of their own. For $4.99/month, subscribers to Hermit_theCrab Gaming will unlock VIP Status in Hermit_theCrab’s Twitch channel. VIPs earn !crabs 3.2 x faster and can get a monthly reward in the mail (see the Donations page to find out what the monthly VIP Reward will be). FAQ – Why can’t I subscribe on Twitch instead? Right now, I am working towards a Twitch Partnership. This would give me a Twitch “sub button” embedded in the channel. A Twitch sub button allows viewers to subscribe via Twitch and grants access to special Twitch subscriber chat emotes. The goal is to show Twitch that there is a big enough fan-base for the stream for Hermit_theCrab Gaming to deserve an official Twitch sub button. 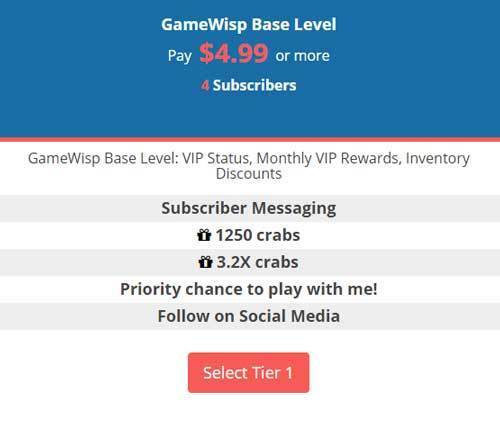 Until I earn a Twitch subscription button, you can subscribe to Hermit_theCrab using GameWisp. You can show your support for the stream in lots of other ways. Subscribe to IamHermitTheCrab on Youtube. It is free to subscribe on YouTube (like a Twitter follow) and you’ll see the latest Hermit_theCrab Gaming videos in your YouTube newsfeed. Follow Hermit on social media. Following @Hermit_theCrab on Twitter and IamHermitTheCrab on Facebook helps the channel grow and can help us earn a Twitch partnership. Plus, following keeps you updated on the latest events in the channel and fun news in gaming. Let your friends know about Hermit_theCrab gaming by giving Hermit a shout-out on social media.